Here comes our next Speakeasy session. 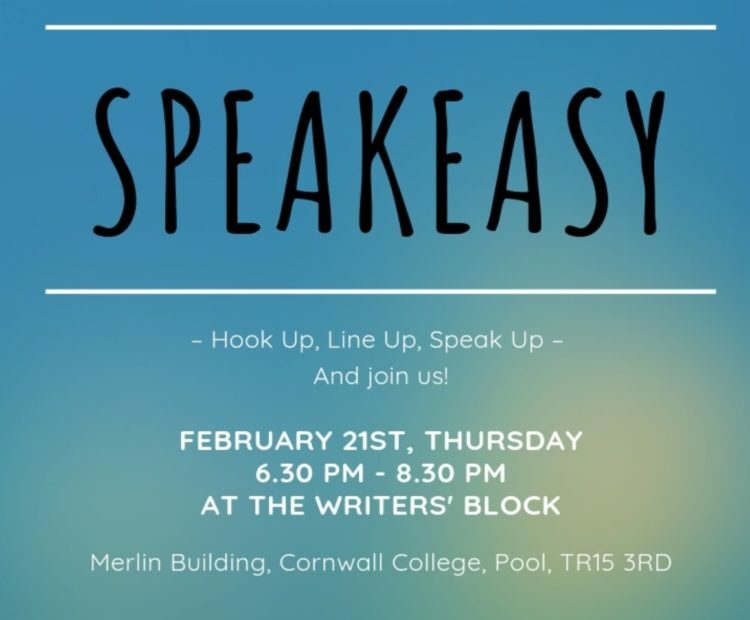 Share your work, meet other writers and discover the new with compere Taran Spalding-Jenkin, spoken word poet and storyteller. Are you a storyteller, a poet, a fictional writer, a comic or perhaps a musician? Well, this is where we want you! Come and experience some of Cornwall’s up and coming writing talent and discover the new. Do you want your ears tickled? Then this is the place to satisfy the need, have a good listen and discover what else is out there. A showcase and sharing event for emerging and young writers. Mid-teens into adulthood and beyond! Short stories, poetry, song and spoken word.